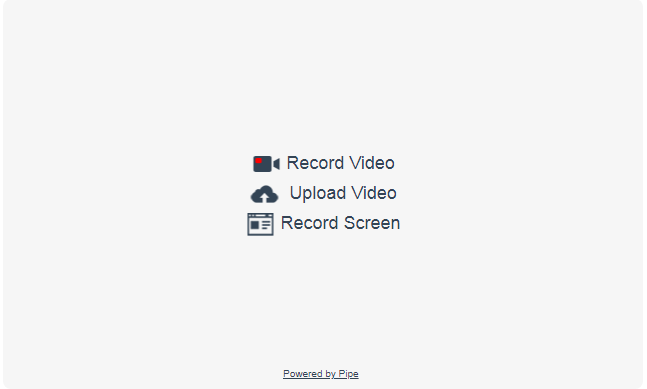 We've first introduced the screen recording functionality in Pipe more than a year ago. It only worked in Chrome and it required a self published Chrome extension for the website where Pipe was embedded. We've built such an extension for interested parties to use but the entry cost in development time was still high resulting in only a few of our trial users & clients experimenting with the feature. But now, with the release of Chrome 72 and Firefox 66, standards compliant screen capture without extensions is natively supported by the 2 major browsers. So today we're updating the Pipe platform with the ability to record your screen on desktop devices in both Firefox and Chrome without having to worry about publishing a custom extension. Turning on screen recording became a matter of option, not of careful custom development and extension publishing. Clients who are currently using the initial screen recording functionality through their own published Chrome extension will automatically migrate to the upgraded functionality. No change is needed on their part. Their users will not be promted to install the Chrome extension anymore. The srec parameter, which in the past held the Chrome extension id, has been reused as shown above. If you have srec configured with your Chrome extension id, it will turn on the screen recording feature as if it was set to 1. Screen recording works in Chrome 72+ and Firefox 66+ over secure origins (HTTPS). 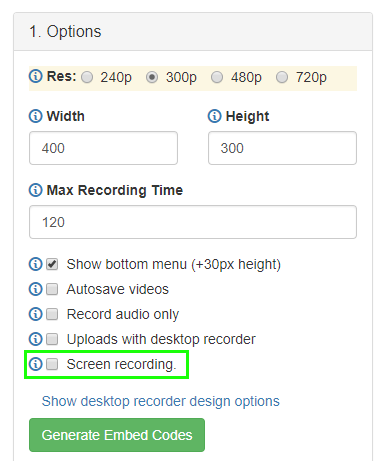 Screen recording is only available with the HTML5 desktop recorder. On Chrome you can record: the entire screen, a specific application window or a specific Chrome tab. On Firefox you can record: the entire screen or a specific application window. Screen recording produces high resolution videos so the feature is only available with PRO accounts. We recommend turning off screen mirroring if you have it active, otherwise during the recording you will see a mirrored image of the screen in the recorder. On Chrome, recording a tab will throw the error Device error: no audio or video data if no activity is registered in the captured tab (no mouse movements, no scrolling etc). We believe this is a Chrome bug so we've submitted a bug report to Chrome for further investigations. On Firefox, recording certain application windows, i.e. a Chrome window, will result in black screen videos. The audio will be recorded as expected.